Once you get the go-ahead from your doctor, elderly resistance training can be an excellent part of a healthy late adulthood lifestyle. Resistance training, often called strength or weight training is physical activity performed at a controlled speed. This training works the muscles of the body and is most beneficial when all the ranges of motion are included. The American College of Sports Medicine recommends resistance training be done two-to-three times a week with an average of 8-to-12 repetitions of a series of different resistance-based exercises. Weight training for seniors is completed with weights, exercise balls, exercise bands, cans of soup, and more-anything that causes resistance to your muscles can work. You can even use the resistance force of your bedroom wall or another person. This is one exercise activity you can do anywhere and in a pinch, you can use alternate tools for weights; such as the soup cans noted above. Note that while there are basic recommendations, no one should begin resistance training without talking it over with their doctor. People vary in their abilities, and overdoing it or doing too much too soon can cause serious health problems and long-term muscle injury. It's better to build intensity of weight and repetitions gradually. Resistance training is an important component of physical activity for all age groups, but elderly resistance training has extra special benefits for senior health. The American Heart Association indicates that all age groups can benefit from resistance training. Resistance training enhances an aerobic exercise program. It allows people's bodies to function better on a day-to-day basis; for example, when picking up a small child or a box. It promotes strong muscles all over the body, but very noticeably in the back and abdomen. Regular training reduces the risk of back injury. Studies note that resistance training improves the physical activity you already do. If you play golf your swing will improve. If you like to swim your strokes will improve and so on. Progressive weight training can help prevent and treat a multitude of health issues. Risks of chronic diseases, including cardiovascular disease, obesity, diabetes, and more are lowered with regular resistance training because the body has more muscle and less fat. Enhanced psychological well-being, including a more positive self-image, because the body is more fit and the individual is able to operate independently. Why Try Elderly Resistance Training? Various research studies suggest that while resistance training is healthy for everyone, elderly individuals can specifically benefit in many ways. For example, exercise for an elderly individual is more significantly helpful in maintaining heart and lung strength than it is to a younger person. Studies show that people over the age of 80 were able to increase muscle strength and muscle endurance. Weight training allows an elderly individual to walk longer before becoming tired. Both leg strength and walking ability are huge indicators of an older person's overall health. You want to be able to walk long and far. Women of any age can increase bone mass with regular resistance training. Research shows that even if a woman is past menopause, strength training will increase bone density, which can prevent breaks and pain. Resistance training provides an improved overall quality of life and healthy aging process when seniors who do exercise are compared to those who do not exercise. Regular resistance training can decrease the risk for depression. Some studies also indicate that individuals are more prone to heart attacks if they lead a sedentary lifestyle, but suddenly have to engage in physical exertion. It's better for the body to stay active with regular movement and exercise to avoid sudden shocks to the system. 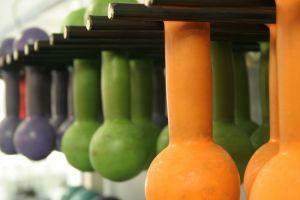 Resistance training works the muscles in a different way than regular aerobic exercise. It's recommend that even experienced athletes start slow and progress upwards when starting a strength training program. Have a full physical and detailed discussion with your doctor to find out if resistance training is right for you and also to plan the perfect training program for your personal situation. Locate a professional trainer who can help you learn the ropes of resistance training before doing exercises alone. Most health clubs, elderly community centers, and gyms along with some retirement communities, have trainers who can help you learn the moves. Extra stretching and warm-up time, plus a proper cool-down time is a must for participating in regular resistance training, no matter what your age.